Panwrypter provides an additional layer of security when it comes to restoring your protected files. In addition to allowing you to protect your files, by depleting them for protected storage across multiple physical and logical locations (sites), you also have the option to restrict where your protected files can be restored from. This added layer of security provides another barrier to unauthorized recovery of your files by restricting the restore of your protected volumes to a default restrict radius of approximately 500 feet/152 meters of the physical location(s) that you designate, when you initially protect your files. You can configure the restrict radius in Preferences. This setting only affects creation of new protected sessions. This type of file and folder protection is very useful, because it prevents cybercriminals from accessing your files, unless they are close to one of your designated allowed restore locations. A cybercriminal cannot know where your allowed restore locations are - this knowledge is with you. To get a better understanding of how this feature works, we recommend that you perform a few test protect & restore exercises with some files that have been protected with some allowed restore locations, from different physical locations. Allowed restore locations are defined when you first protect your files & folders to create a protected session. An Allowed restore location is any designated physical location from which you will allow the restore of your Panwrypter protected session - the group of files & folders that you protected. When you want to restore your protected files at a later time, you must be within range of any one of the allowed restore locations that you defined previously when you protected your files, or you will not be allowed to restore from that physical location. This type of security measure is useful in the event that an attacker is able to recover all of the protected volumes from all of your storage sites, as it prevents recovery of your files if they are not in one of the physical allowed restore locations that you specified when you initially protected your files. To enable restore restrictions, simply select the "Yes, restrict the restore of my files to these locations..." checkbox. This will enable the map, along with related buttons that allow you to specify the locations. To navigate the map, you can use the mouse to drag the map to your desired location, or simply enter an address in the address field above the map. You can switch map views between Map/Satellite/Hybrid, by selecting these buttons from the lower left corner of the map. To zoom in to a specific location, you can double click on a specific area of the map. You can also select the +/- buttons next to the navigation controls in the lower right corner of the map. To zoom in to the current position in the center of the map, select the (magnifying glass) button near the lower right corner of the map. To zoom in to your current location, select the (diagonal arrow) button near the lower right corner of the map. Note: This feature requires that you enable location services on your Mac. You may be asked to enable location services if it is disabled. To zoom out to a global view, select the (globe) button near the lower right corner of the map. To allow the restore of your protected files from a specific location, select the (+) button at the top right of the map. To remove a specific allowed restore location, select the pin that you want to remove so that it's LAT/LON caption is displayed, then select the (-) button at the top right of the map. To remove all allowed restore locations, select the (x) button at the top right of the map. IMPORTANT: If you choose to limit your restore locations, make sure you have easy physical access to at least one of these locations. If you are not able to physically be at an allowed restore location, you won't be allowed to restore your files. 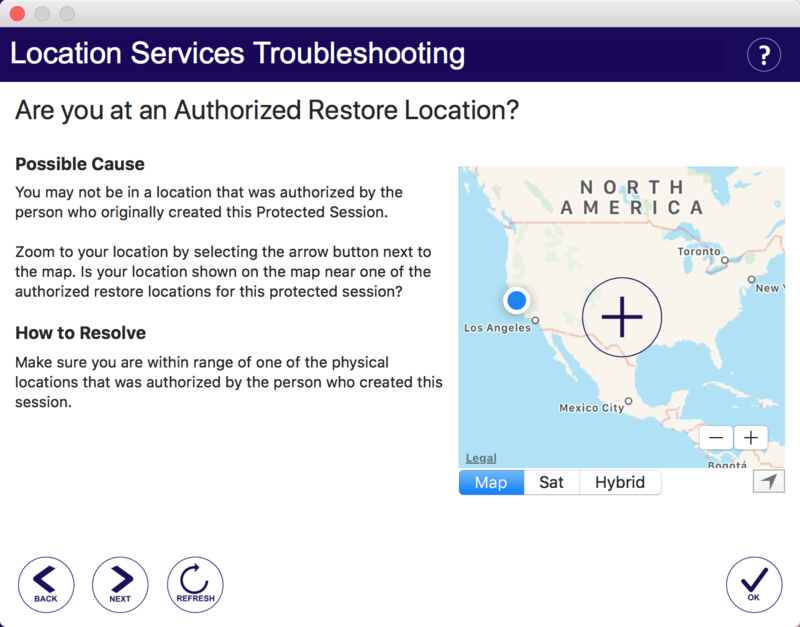 When you attempt to restore your protected files with restore restrictions, a check will be performed during the restore using your current physical location. With this in mind, Panwrypter will need to know where you are physically so it can determine whether you are permitted to restore from your present physical location. This means you'll need to enable location services. If you are in an allowed restore location, the restore of your files will proceed. If you are not in an allowed restore location, the restore of your files will be denied.